I am back from my holiday in USA. Flown in yesterday morning after 12 fantastic days travelling the Southern States. I saw some great cities and met some wonderful and interesting people (some weird ones too.....). Obviously I am bringing back fabric from my trip. Sadly I only found one real fabric shop on my whole trip. There were a couple that were suggested to me in the New Orleans area but there were a little far away from where I was so I couldn't see them and when I did have transportation they were closed as it was Easter. The fabric shop I found was in Salvannah Georgia. A great little shop called 'Fabrica' where I obviously had to buy something. 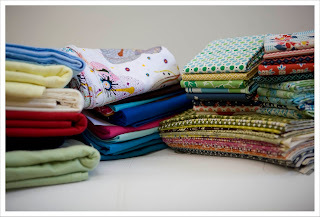 In a lot of towns where I enquired about fabric/Quilt shops I was told "yes there was a great one but it closed last year", that is rather sad, don't you think? Most of my purchases however are from the usual online sources (aka Fabricworm, Pink Chalk fabric and some others) and I had the packages sent to my hotels. That way I saved on postage and most importantly tax. So here is photo of it (please don't judege me to harshly) and over the coming weeks I shall make proper Stash Notes on each of the packages. Most importantly however if you look at the fabric on the right upper corner. Got it ? That is the new line from Denyse Schmidt which looks great. This will be part of my first upcoming giveaway to celebrate my first quilting anniversary. I will add a few coordination solids also. The giveaway will be announced officilly on the weekend so stay tuned !! Back to sewing now as I still have the day off today. Marvellous. Lost to do: a bee block for my new Brit BEE, the back for my Springtime quilt (will post a photo of the front tomorrow), 3 more blocks of the Laugh and Hapiness quilts and I also have a new commission I need to tend too. Wow! What a brilliant haul :-) Glad you had a good time. Judge you harshly? Of course not! I'm deeply envious mind you, but happy for you :-) That bundle underneath DS has caught my eye tho... Am I spying some "silent cinema"? Or is it a fabricworm custom bundle? Glad you enjoyed yourself, and oh to have a haul like that! Wow - I am so jealous!! Ordering to the hotel was a great idea! New fabric: one of the best travel souvenirs, don't you think? ?